Is Park and Rec About to Remove 2 North OB Park Picnic Tables Due to Complaints From OB’s Gentry? UPDATE: It has been confirmed to the OB Rag by a Park and Rec manager that these two picnic tables will be moved. Dan Danerio said that these two tables have not always been where they are now, that his department had a couple extra ones and decided to place them in the grassy area as an experiment. It didn’t work out due to complaints from local homeowners, including some of the new owners of the large mansions close to the tables. Danerio told us that his department would be pleased to work with the community in order to find a different location for them. He is willing to accept and hear feedback about those locations; his number is (619) 235-5914. 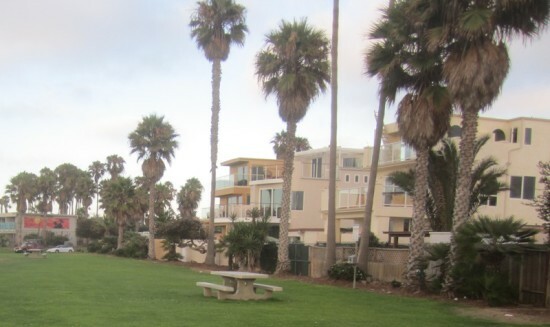 The OB Rag has heard from a reliable and responsible local businessperson that that Park and Rec was about to remove two public picnic tables in the grassy area of north OB. They were informed of this by a low-ranking San Diego Park and Recreation staff person. Why? Why would Park and Rec remove two picnic tables? The word on the street is because Park and Rec has received “complaints” about homeless people hanging out and taking over the tables. We sent an OB Rag reporter over to the area to check it out – some call it “Brighton Street Park” – but it’s the grassy area to the left as you come into the north OB parking lot. 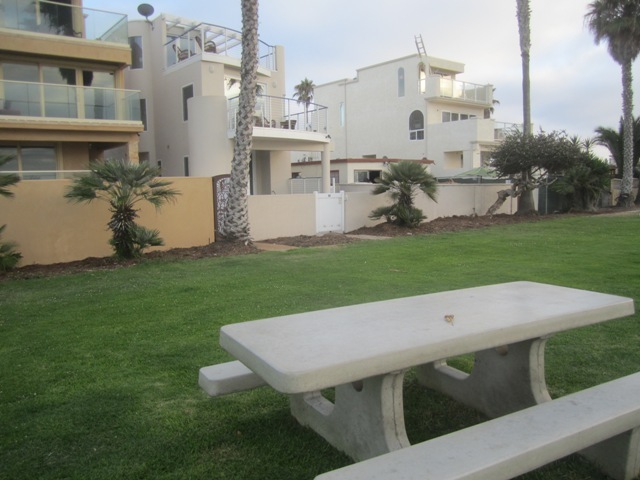 The houses right next to these tables are the McMansions of OB’s new Gentry – the families who have gotten away with improper variances and built their large 3 story single-family homes on West Pt Loma Boulevard – and whose backyards face the grassy area in question. The tables and benches look almost brand new. In contrast, a third table close by has seen many storms, but that’s not the one to be removed. The reporter spoke to some local residents who live in the same area, and asked them about the homeless taking over the tables. Their response was “nah”. But it is clear that the new large houses that front the park look right down on the picnic tables. Could OB’s new gentry, the victors in the war of gentrification, have made the complaint? If true, this is exactly what some have feared from the gentrification of that area of Ocean Beach. The new gentry feel the park is theirs. We have calls into both the Park and Rec Department and the OB Rec Center, looking for answers. To be fair, I’ve seen several straight up fist fights around these tables since May…. I’m not surprised homeowners don’t want that around. Meanwhile, another table has been cordoned off for the last week with a beehive living on the underside…. Never seen or heard anything resembling a fight there, and I’m close enough you can see my residence in one of the pictures. While there are homeless people in the park they are rarely any kind of trouble, and the tables in question usually have one person sitting with a book and a cup of coffee or a family having a picnic on the weekend. It sounds like some people have a problem with people they don’t like the looks of, merely existing in public spaces near them. That’s not a crime and if parks and rec is conducting business by listening to a minority frivolously complaining about lawful activities by other citizens in their presence, parks and rec aren’t serving the populace as they should. It’s appropriate for a public park to have someplace to sit. We’ve used those picnic tables for that purpose, and we’re not homeless. I walk through Ocean Beach Park every morning picking up litter and dog piles, and sometimes sit at the tables. They are well used by surfers, visitors and families especially on weekends. We need another table as well, and covered trash cans next to the tables (not grouped on concrete for the convenience of the trash trucks). This park is great for picnickers and families too. Do not remove any tables. Add more. And remove the bee hive before the 4th! More tables, a dance pavilion and bandstand, an outdoor stage with a hi-def monitor for surf movies, nightly, all summer long, hula contests often! Premade plans from some collection. That’s why they don’t fit the character of the neighborhood. But I bet if you tracked down Stebbins’ other work you’d find a dozen more of each one, all just as out of character. so once they remove the picnic tables, then its just a grass field, and how long until they decide the empty grass should be developed? I mean, is it or is it not a park? If it is, then keep the picnic tables. did they buy homes to be next to a unique serene beach park, or to eventually get the view blocked by more shiite buildings. wish they werent such fools about their own neighborhood. and stop trying to disconnect their lives from anything real other than real estate. can we get an interview with the complainants to at least discuss? It’s typical of the wealthy to have a false sense of entitlement. A luxurious home and car and an extravagant lifestyle are not enough for them; they also must control those around them, to preserve their illusion of idyllic surroundings even in the midst of the suffering they themselves create. They see themselves as more worthy or deserving or important than others, thus they assert their “right” to control others. Unfortunately, our entire country has become a plutocracy, or perhaps a plutarchy, and our own local politics reflect that larger agenda. I would like the picnic tables to stay, but more importantly some of the beach parking lot should be metered, with the money used to fund solar-powered electric vehicle chargers. Let’s reward visitors who don’t burn oil into our air on the way in. A band stand and dance floor also sound like great ideas. That idea’s been done to death right on that site. Seems the Pacific Ocean didn’t like the project too much. I propose a petting zoo, with perhaps 500 MONKEYS. Oh wait they already did that too. All kidding aside you can’t meter the lots without a complete permit parking program for the whole west-of-I-5 area. (IIRC Santa Cruz and a few LA area beach communities have such a program and I wonder if they actually turn a profit) What would happen is all the tourists would crowd the adjacent streets and occupy all the residents’ regular parking facilities to avoid the meters. Given your expressed sentiments about automobile owners you might find that inconvenience a side benefit, but for the majority it would be unacceptable. Those are good ideas, but first I think we need to make sure the rich gentry do not steal our park for their backyard because they built all over theirs. I didn’t realize you had to be below a certain income level to complain about noise.Would it be more relevant if a person struggling to make ends meet filed a complaint? I’m sure the tables draw people closer to those homes.They should deal with loud voices and the cigarette smell in their house? How is vilifying these people accomplishing anything?Moving the tables seems like an easy fix. So those of us who aren’t homeless or drunk, can’t have seating in the park because it bothers the rich folk? That doesn’t sound fair, does it? Especially since it’s a public park and not their backyard. We as a society need to quit being uncivil to ourselves out of fear that the homeless will come. We remove benches, we make public street furniture unwelcome, we cut off showers, homeless advocates are threatened with arrest for feeding homeless. If we spent one fraction on the homeless of what we spend in trying to curtail them and their activities, we wouldn’t have as many. I’d never made that connection before, that you had to donate to a politician’s campaign to get their campaign materials. I guess that makes them a lobbyist, or at least the kind of person who writes a check for $500 and expects so pick up the phone and call in a favor for it in return someday. I do recall in 2004 if I wanted a little button for the Kerry/Edwards ticket I could just write for one and they’d send it for free. Bush/Cheney? They wanted $12 for the same thing. Can I finally add on another angle about the homeless and the perception they poop or pee randomly like animals…..well the policy until now is to deny them the most basic human needs. Not just needs, the effect is to deny them dignity. They used to have a sink with running water at the car wash on Voltaire years ago but removed it because it attracted the homeless. Can’t even provide running water. Virtually no business has public restrooms. When you deprive people of all human dignity and try to drive them away by making just existing, relieving themselves, so inconvenient they’ve no choice but to move on, what would you expect but for them to develop utter contempt for society? To not care what people think of them? To look at homeless relieving themselves wherever and whenever and using that for rationale to dismiss them as members of society as absurd. Our cold hearted policies to push the problem elsewhere made them that way, we’re merely reaping what we sow. If fights occur in this area with frequency, should we add LIGHTS and more POLICE PRESENCE then take it out on those who want to sit and take a break on something as harmless as a park bench? Would the county parks and rec department please stop taking stuff away from OB, and instead, give us more street lights and public restrooms near/on Newport? I agree that more lights in OB would be really helpful! It surprises me how much credit people are giving these few home owners for making all these changes in OB. Maybe someone did complain about the new benches drawing people closer to their homes, maybe not. A simple solution is to just move the benches closer to the parking lot as oppose to any and all of the homes that are up against the grass area of OB. People are going to use the area whether the benches are there or not. I think having the benches are a nice additional, but I would agree that if they are just moved further from a persons property, problem solved. And there is always a constant plug about these homeowners being rich, etc, really is building a home now what makes you considered rich? I think in time people will realize it’s not Stebbins that owns all four properties. He’s been an understandably easy target- an attorney who drives a Mercedes. Burks is a regular guy, the Doumas I’ve known for years. His dad bought the original house in the 50s and he was born there. He toils away at a civil service type job for the navy. When I moved out of 5168 and physical issues mounted John took 3 days off work and pitched in and helped with the heavy work. Like it or not Douma and Burks are as much obecians as anyone and while protecting OBs character is important it doesn’t have to include creating villains out of average people. To its credit I believe the OB Rag has strived for accuracy in its reporting and the human fault of mob mentality and fear of change is what’s driven some of these sentiments. When you look your enemy in the eye and see he’s human like you it’s difficult to keep hating him. In the off leash area of Dusty Rhodes park there are no tables, and people are bringing and leaving old chairs.